We focused most of our development effort this month on the rollout of our new account management and billing system. That’s exciting for us, even if it sounds a little “under the hood” to you. A better solution here should take us less time to maintain, though, freeing up more capacity for our developers to work on cool new features. Lots of LivePlan users have been creating infographic-style pitches for their businesses using our recently introduced Pitch Builder tool. One of the most common enhancement requests there has been more flexibility in the financial section. Some of this feedback came from early-stage startups who weren’t ready to do detailed forecasts yet. Some of it came from users who wanted to publish and share their pitches but not necessarily their numbers. We now give you the flexibility to pitch your financials as you like. 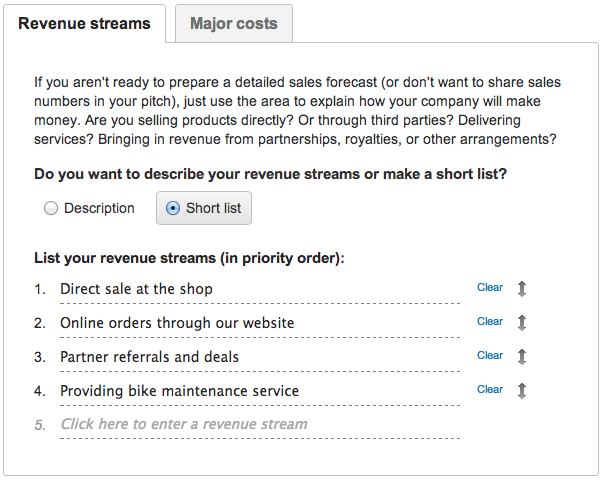 In the financials step of the Pitch Builder, you have the option to prepare detailed forecasts as before or to just describe or list your revenue streams and major costs — without getting into the numbers. Check it out. We think you’ll like it. We designed the Pitch Builder with fairly stringent limits on how much content you can enter in each section. That’s are part of what makes the pitch look so good: all of the elements are the right size and nicely balanced with the rest of the page. To make it easier to write to fit in the allotted space, we have spruced up the entry fields to provide handy feedback on how much room is left for you to work with. When possible, we’ve also allowed you to write more content than will fit, then edit that down so you get just the right message in your final pitch — much like Twitter does. The result is a faster, smoother pitch creation experience. In the next several months, we’ll be working on several major projects to improve the app’s overall speed and responsiveness. We know your time is valuable, and we want you to get your work done in LivePlan as quickly as possible so you can get back to running your business. As one step in this direction, we have added reasonable limits on how many products can be added to the sales forecast, expenses to the budget, etc., both to ensure better business plans and to avoid having a handful of plans with huge amounts of data slow down the rest of the service. As always, we are eager to hear your feedback. How do you like the latest update? What would you like us to tackle next? Just click the Contact Us button at the top of the app to drop us a quick note.